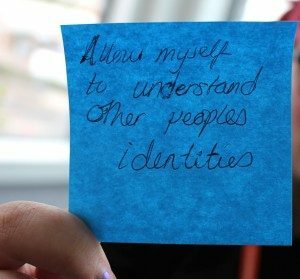 Rachel reflects on our Equalities Workshops with high school students in schools across Greater Manchester for National Anti-Bullying Week. Over this past year a number of Art with Heart’s projects have unintentionally coincided with huge social and political moments. Our latest production Declaration with the EU referendum, and This November we we spent two weeks delivering workshops exploring equality with Year 8, 9 and 10 students during the closing weeks of the U.S. Presidential election. During the workshops, which align with National Anti-Bullying week, we ask the students to discuss how they would define equality and inequality, to look at the Equalities Act 2010, debate whether laws make a difference and explore how we can as individuals. With the U.S. Presidential Election result falling directly in between our 2 weeks of workshops and the surrounding controversy it didn’t take long for the ’T’ word to surface. We ask the students to work in small groups to discuss examples of inequality that they see in their everyday lives; personal experiences or examples they see on the news and social media. There were a number of examples which were mentioned repeatedly; a number of students said they received racist comments on their local bus service, racist police brutality in America and the subsequent #blacklivesmatter movement, the rise of Islamaphobia, women’s continuing fight for equality in the workplace, the Orlando shooting and spate of murders of Trans people in the U.S., as well and rarer examples such as the Hutus and Tutsis and Rwandan Genocide. The example which cropped up in all 29 workshops however was America’s new president elect, Donald Trump. There was talk of walls, Mexicans, sexual assault, Russia and World War 3. Many of the students, like many adults I know felt incredibly frightened and angry. You can offer some reassurances, “He would have to get the approval to push ‘the wall’ law through.” However the fact of the matter is, we are frightened too, and we believe it’s important to be honest with young people about this. When we deliver workshops with young people it is incredibly important that we create a space for them to talk honestly and openly without judgement, ask questions, exercise opinions, explore and form their personal values. The reason no two workshops are ever the same is because we respond to what the young people need. If they need to talk about Trump, we’ll talk about Trump. And we did. A lot. It was important. It was a huge moment in our collective history and one which will go onto shape their futures and the world they live in. Whilst discussing LGBTQ+ discrimination with one group, a student sunk her head in her hands, lifting it momentarily to ask in disbelief, “How can somebody hate something that much?”. We talked about what starts and drives hatred, about compassion and what it means to be a good ally. We talk about the importance of acknowledging your privilege and standing in support of communities who face discrimination. The final part of our workshop involves students discussing how we can help make equality a reality. Ideas included using computer games and T.V. to change opinions and push messages of equality, creating safe spaces for communities to come together and learn and teaching the Equality Act 2010, and why it’s important as part of the curriculum. Finally we ask them to write a personal pledge of an action they can take to help make equality a reality. There are some examples pictured below. Through our workshops we discussed equality with over 600 students aged 12-16. These young people spoke with maturity, passion and eloquence, giving us a renewed sense of hope for the future, for humanity, for the fight for equality. Yet among the messages of hope and pledges to protest, were messages of hopelessness, “I can’t do anything. I don’t think every person will respect everyone and I personally believe it’s impossible”. During the workshops we asked the students if they felt they had equality in their lives. Out of 600 young people, less than 10% felt they truly experienced equality and an overwhelming majority felt that discrimination and inequality were getting worse. Many of the students felt that they didn’t have equality on account of their age, and that they were often discriminated against. A large number drew examples of being treated with suspicion when shopping with friends, of their opinions been discounted and disrespected; “Adults views are always considered over ours”. So often we tell our young people to act like adults, take responsibility for their actions, treat others with respect, yet it is clear that we are not leading by example. So we challenge you, fellow adults and humans, to take a lead, set an example, make a young person feel valued. We challenge you to listen more, to use your agency to create environments and spaces in which honest discussion can take place; to open conversations about the difficult stuff, to encourage debate and place the same importance on helping young people develop their values as their grammar. The next generation are intelligent, compassionate and informed. Their voices deserve to be heard. Be an ally to a young person today, listen.